Hello everyone ♥, Happy Sunday, I hope your preparations for Christmas are going well. 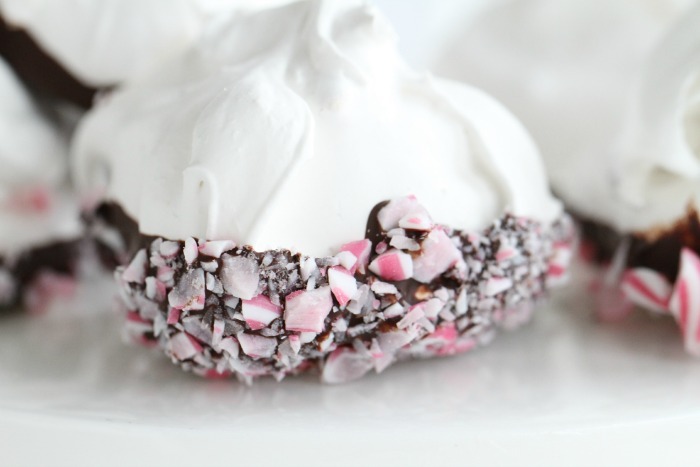 Today’s temptation, divinity, is the perfect Christmas sweet treat! 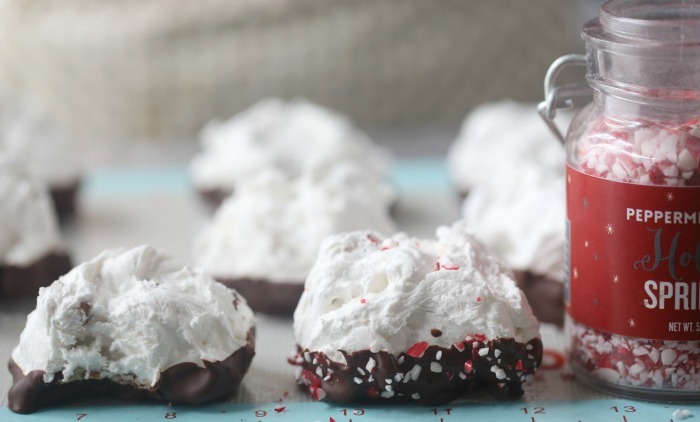 Divinity is quite sweet because it is made with lots of sugar, I dipp these into dark chocolate and rolled in crushed candy canes. A “southern treat” originally from the Savannah area in the USA, and it is so delicious. See the video below how to make these. In a heavy saucepan over medium heat, stir together the sugar, corn syrup, and water. Stir only until sugar has dissolved. This step is so important so please make sure the sugar is totally dissolved before you proceed. Do not stir after this point. Cook syrup mixture until it reaches 250 degrees F on a candy thermometer, bringing it to a hard ball stage. While the syrup is cooking, beat the egg whites until stiff peaks form. Once the sugar mixture reaches 250 F / 121 C°. carefully pour a slow steady stream of syrup into the stiffly beaten egg whites, beating constantly at high speed. 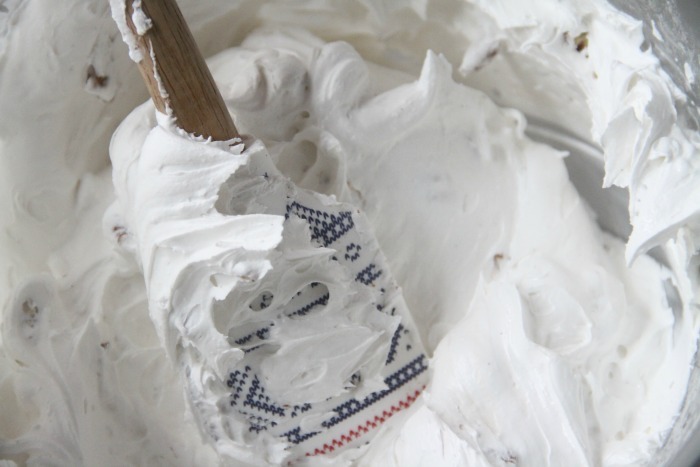 Add the vanilla and continue to beat until mixture holds its shape, approximately 5 minutes. Stir in pecans. Using 2 spoons, drop the divinity onto waxed paper, using 1 spoon to push the candy off the other. This may take a little practice because the technique is to twirl the pushing spoon, making the candy look like the top of a soft serve ice cream. If the candy becomes too stiff, add a few drops of hot water. You will need to work fast when making this type of candy. After you spoon the cooked sugar and nuts onto a silicon matts or a waxed paper, you’re done. Cool the candies on racks completely. You can store them in an airtight container for up to 2 weeks. 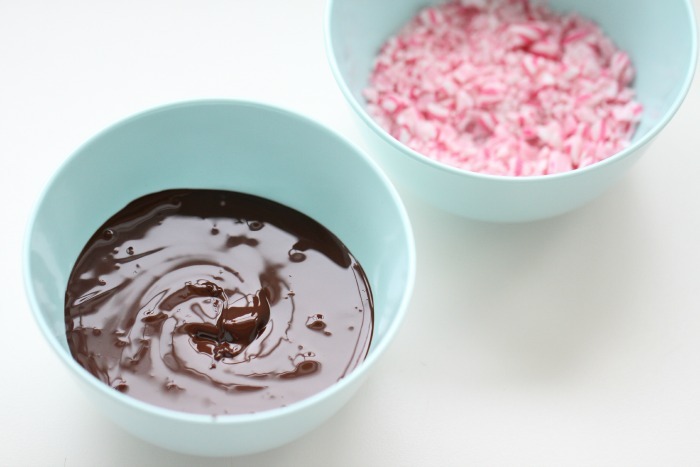 Dipp the end in melted dark chocolate, and add some crushed candy cane on the chocolate let set and enjoy. mm, disse så gode ut! Hei! Kan man finne light corn syrup i dagligvaren? Hvor mange blir det ca v denne oppskriften? er det mulig å bruke mørk corn syrup i disse? Men hvor lenge holder de seg om en skal lage de som have til Jul? Åh vad goda de ser ut!! Tack för en superfin och bra blogg! Du hjälper mig att stilla mitt bakbegär nu när jag inte har någon ugn! Tack! Gleder meg til å sette igang å bake og å kose meg. Er disse sprø, og ikke så langt unne pikekyss? Skal vanilje ekstrakt i kjelen sammen med sukker etc? Hei! Hvor kan jeg få tak i termometeret ? Hvordan oppbevares disse best og hvor lenge holder de? Manuela…. Du er heeeeeeeeeelt fantastisk!!!!! Alle disse fantastiske oppskriftene dine!!! Du er en pen, søt og nydelig sjeni!!!!!!!!!!!!!!!!!!!!!!!!!!!!!! Lov meg at du ALDRI legger denne bloggen ned!!!!!!! Du har de beste oppskriftene og du bruker kun naturlige varer!!!!!!!!!!! Du er min store bake idol!!!!!!!!!!!!!! Klem Viktoria!! !